Presenting an intimate with a warm welcome, The newly renovated Caesar Premier Jerusalem Hotel offers vacationers and business guests a warm and courteous welcome in the heart of Jerusalem. The hotel is just 30 minutes drive fron Ben Gurion Airport and less than an hour to Tel Aviv and the Dead Sea. It is close to many of Jerusalem's famous historical sites and very near to the International Convention Center. 150 tasteful and comfortable rooms. . The hotel attractively furnished rooms are fully airconditioned, heated with private bath, shower, wall to wall carpeting, radio and telephone in all rooms. Cabled TV radio and direct dial phone with voice mail. Each room includes a mini-refrigerator, cabele tv, wireless internet, coffee/tea set thee rooms may accomodate 2 adults and up to 2 children. The hotel is just 10 minutes walking from the center & 20 minutes walking from the old city. The hotel is just 30 minutes drive fron Ben Gurion Airport and less than an hour to Tel Aviv and the Dead Sea. 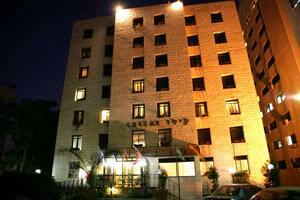 It is close to many of Jerusalem's famous historical sites and very near to the International Convention Center.